1982 Nirvana Bat-tail Three Fin. 5ft 8 1/2"
Two 4 1/2'' x 4'' base, on rails. 1.Two Nirvana large decals, black/white on rails at sweet spot, see image below. 2. Handcrafted by Ronnie Woodward, black script at rear sweet spot? 1. Large Double N logo, black on nose. Rainbow (red-blue) sprayed deck patch, indented around rail decals. Adhesive Rip Curl decal, black/white, on nose, left. Black pin lines with scallops. BOARD HISTORY: Purchased October 2000. Spelling corrected (from Nivana) for the entry in Februaury 2014, following an email fromTerry Ryan noting the error. Fin experimentation following Simon Anderson's Thruster saw many variations, some based on the original inspiration - a twin fin II with a smaller centre trailing stabilizer fin. 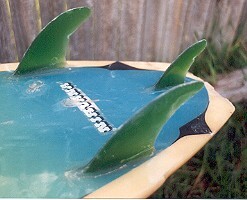 These often appeared with the centre fin in a fin box to allow the rider to adapt to the new set up. re : Age, Nevada, Nirvarna Surfboards. Alf Jeffries started AGE Surfboards....with Gary (willer??? - not exactly sure of the surname) who ran the retail side at Bankstown, circa 1966 - 1967. Alf ran the factory at Lakemba, employees included Billy "Black Boy" Cilia. About 1971 - 1972, Alf changed the name to Nirvana Surfboards and later on moved the factory to Kincumber. In the late 1970's, Alf sold Nivarna surfboards (proprietor unknown) and relocated to Western Australia. Alf Jefferies currently resides in Coffs Harbour. Geoff Cater (2000-2014) : Catalogue : #93 Nirvana Bat Tail, 1982.